Mark installed a bird house hole guard or protector on his sister's bluebird house since she was having trouble with squirrels chewing out the hole and making it larger. He hid a large washer around the hole and then shaped a wooden doughnut to cover the washer up. First, the wood was recessed so the washer would be flush with the wood. 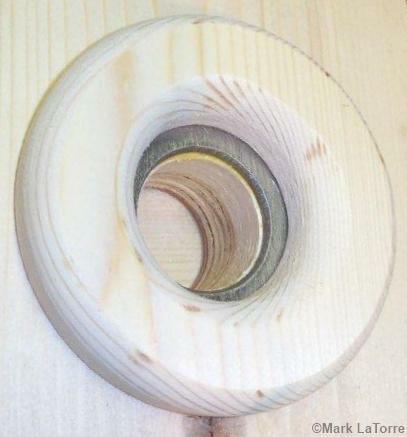 A round piece was cut with a hole saw. The piece was shaped with a router. The doughnut was mounted over the washer and painted. Mark didn't say how the doughnut was mounted, but I assume it was glued around the outside. The washer would make it difficult to attach with screws from the back side. 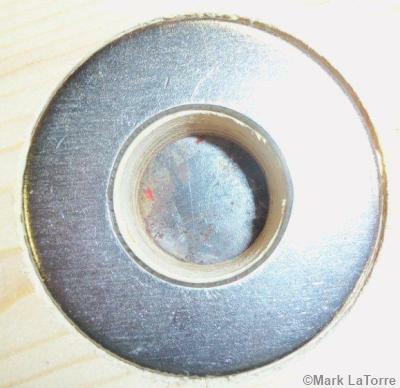 The area surrounding the hole is recessed so the washer sits flush. Finished Bluebird House w/ Hole Guard Installed. Yes, Mark's sister is a University at Birmingham fan, hence the colors! No doubt the washer will slow a squirrel down. They may try to gnaw around the hole and could cause a lot of damage to the doughnut, but they will not gnaw through the washer. If given enough time, they could eventually dislodge the washer, but let's hope those squirrels give up and move on to natural holes before that happens. 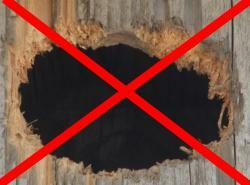 Mark explained, "I know that there are many easier ways to install metal at the entrance of the birdhouse. But this way gives me the finished look that I wanted. 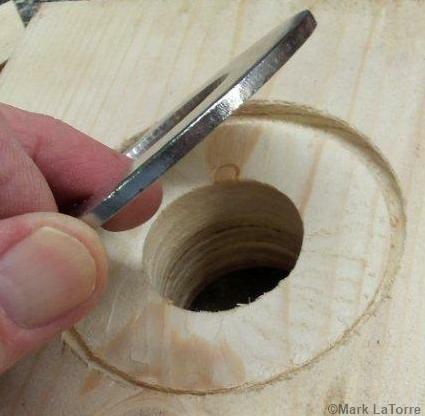 Heck you could just take a can lid and nail it to the front after cutting a correctly sized hole in the center and it would work just as well. I just don't care for the look it would have." 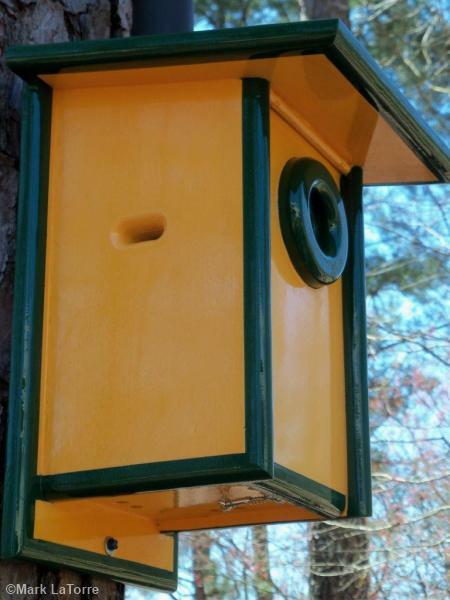 Go to the bluebird house plans page to view the detailed plans which includes an insulated layer and heat vent tube to reduce the temperature inside the birdhouse on hot days. One of the most unique bluebird house plans we have seen. Basic Bluebird House Plans - Basic one-board bluebird bird house plans and others including Peterson, Gilbertson and boxes for Western and Eastern Bluebirds.